When I heard that actor John Mahoney died last week, it felt like a relative had passed away in the family. Mahoney’s warmth and endearing presence on the hit TV show, Frasier, had touched and moved me in the late nineties. I felt a part of me had died when I heard this news. 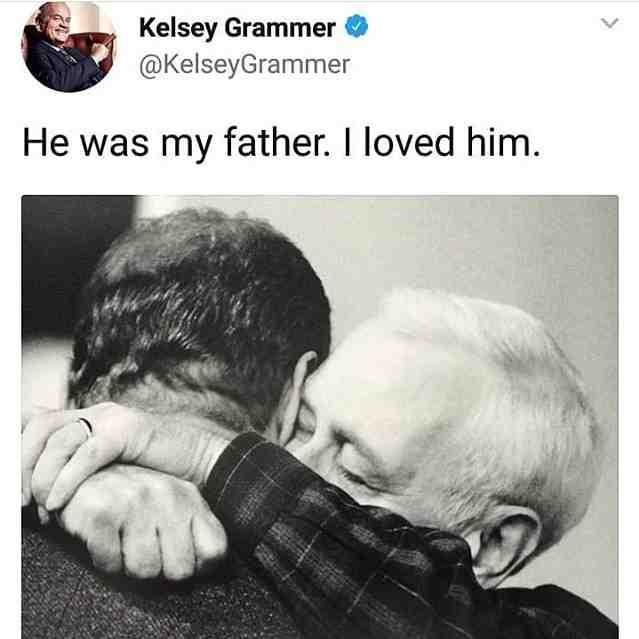 He played Frasier’s father, Martin (Marty) Crane, a retired cop whose character was honest, a down to earth family man, with a big heart and a wonderful captivating laugh. Along with Kelsey Grammer and David Hyde Pierce, who played his sons, Mahoney had driven the Emmy-laden sitcom to its position as one of the highest-rated shows on television at the end of its fifth season. He was remembered alongside Eddie, his beloved dog, who used to constantly stare at Frasier. My favourite Marty Crane episodes included the one where Frasier tried to replace his old, duct taped chair with a new one and Marty gave a heart felt speech stating that his old chair meant the world to him because of the memories it brought to him of his late wife and when Frasier was born. Another favourite episode was when he mimicked Daphne whining, as she desperately wanted to change her hair style like Princess Di but didn’t. And finally an earlier episode when he had just dyed his hair to look younger for a date and the hair dye was dripping at the back and had left marks on the head rest of a chair and he didn’t want to move because he didn’t want his date to discover he had dyed his hair. What I didn’t know about Mahoney was that he had a daily mantra. This was revealed in an interview with Francis Guinan, when he talked about his play Rembrandt (in Chicago Tonight). Every day he used to say, “Dear God let me treat everybody, including myself. with love, respect and dignity.” He has said that he wasn’t a religious person but a spiritual one and believed in being “kind and nice as you can be.” It was important for him to be liked, because then he knew that he was fulfilling his mantra. John Mahoney was born Charles John Mahoney in Bispham, Blackpool, England (June 20, 1940 – February 4, 2018). He moved to the U.S. in 1959 when his sister Vera agreed to sponsor him and he studied at Quincy University, Illinois. He taught English at Western Illinois University and then served as an editor for a medical journal. Mahoney wasn’t satisfied with his career and so it wasn’t until he was 37 that he started acting. He took acting classes at St. Nicholas Theatre, which inspired him to resign from his day job and pursue acting full-time. It was after a stage production in Chicago in 1977, when John Malkovich encouraged him to join Steppenwolf Theatre. Mahoney won the Clarence Derwent Award as Most Promising Male Newcomer, then later Broadway‘s Tony Award for Best Featured Actor in a Play for his performance in John Guare‘s The House of Blue Leaves. His first major film role was in the 1987 for Barry Levinson film Tin Men. He went on to have roles in films in the 1980s and 1990s, including Moonstruck, Eight Men Out, Say Anything…, In the Line of Fire, Reality Bites, and The American President & appeared in two Coen brothers films, Barton Fink and The Hudsucker Proxy. He then appeared on Cheers (in a guest role) from which Frasier was a spin off series. Here he made a huge impression on the producers and Kelsey Grammer and was then asked to play Martin Crane on Frasier from 1993 to 2004. THANK YOU JOHN MAHONEY for the laughs and for the inspiration. You’ll be greatly missed. I’ve learnt a lot from you and may your legacy live on. It doesn’t matter if you’re 20, 30, or 40, finding the value of being curious about everything you don’t know and following a passion or a hobby (as long as it gives you joy) and taking calculated risks in your life can pay off. As long as you’re happy and true to yourself and show respect to others – that’s the answer to good mental health and longevity. Also self check – keep a healthy ego by respecting other people and yourself and don’t sweat over the small things in life because life’s too short. We’re all equal after all and part of the human race. Photos courtesy of NBC, Frasier, Kelsey Grammer, Michael Brosilow / Steppenwolf Theatre), Dailyovation, Brandon Ramos & Jamie Divecchio Ramsay.